Peter was wonderful! He was so accommodating to my mother in law who is 80yrs. Old and wanted to see the castle. He arranged for her to be taken to the top so she did not exhaust herself just to getting to the top. He was informative and considerate. Peter was phenomenal! Extremely knowledgeable about his beautiful and historic town. He had plenty of funny and interesting stories to tell as well. Based on our discussions, Peter followed up with an email with further tours, restaurants & things to do & see based on our discussion. We so appreciated that. You can't go wrong with Peter, you'll get a wealth of information and a true appreciation of this city. Peter is five star plus all the way! I have been to Edinburgh many times. When I traveled there with a large group of colleagues a booked Peter as our tour guide. My luck!! We where a group from 28 years to 66 years old and everyone could not stop talking about how fantastic Peter was. We highly recommend him! Peter was just great. Easy to communicate with him before we even arrived in Scotland. He was very knowledgeable and pleasant. We really enjoyed our day with him. I highly recommend him, in fact one of my co-workers is planing on booking him next Summer based on my recommendation. Peter was superb! Our party of six was extremely pleased with Peter's knowledge and enthusiasm for Edinburgh. He had a lot of great stories and a great sense of humor. We would highly recommend him as a guide. TOUR GUIDE RESPONSE: Hi David Its good to hear that you all enjoyed the Edinburgh experience, and thank you for taking the time to write a review. Peter. My wife and I had a wonderful time with Peter. He was a warm, informed, and humorous host who is passionate about Edinburgh - a city he has lived in and around his entire life. Peter answered our questions thoughtfully, and throughout the tour he would allow our feedback to inform what he showed us and told us about. Beyond the time we spent together, we followed Peter's recommendations from where to eat lunch, to what else to while in the city. There's no better way to start our time in this grand city. TOUR GUIDE RESPONSE: Hi Kimberley Happy to know that you enjoyed the tour. Peter. Peter is so knowledgeable it is astonishing. He eats, lives and breathes Edinburgh! Amazing that his enthusiasm is not dimmed after so many tours. Great explanatory pictures are so helpful in understanding things. Highly recommended. Thank you for helping those of us from the other side of the pond piece together the history we never learned beyond Braveheart & 007! Peter is a fantastic guide. He is very cordial and knowledgeable about the history and culture of Edinburgh. I thoroughly enjoyed my tour with him. Our tour was about 5 hours long and Peter provided lots of insightful information and interesting stories about Edinburgh. Peter also gets in touch with you beforehand to understand what your preferences and interests are. I have developed very good appreciation of Edinburgh, thanks to the wonderful efforts that Peter put in this tour. Peter was the perfect choice for my wife, Lynne, and myself. He was a wealth of information about everything in Edinburgh. He should be after several generations of forebears living there! Peter led us with both old, historic Edinburgh and more recent structures. Overall, Peter was a wonderful host. If you want to learn a LOT about Edinburgh, call on Peter! He is the greatest! Peter was very enjoyable and a very knowledgeable guide. He interacted very well with us and told us a lot about Edinburgh that you wouldn't learn on other tours. A great tour! TOUR GUIDE RESPONSE: Hi Lisa Nice to hear you both enjoyed the tour, and thank you for the taking the time to send a review. Peter. Peter was such a great guide! He gave us a great tour of Edinburgh. He really understood what we were looking for in our tour. I would recommend him to anyone visiting Edinburgh who would like to get a good overview of the city. TOUR GUIDE RESPONSE: Hi Amanda Its good to hear you both enjoyed our wee walk around Edinburgh, and thank you for taking the time to write a review. Peter. We have used Peter as a guide before and we simply love him. He goes out of his way to show us the sights and sites frequently overlooked in Edinburgh and he is mindful of our preferences and gives his all each time. We spent a lovely day with him and cannot wait to see him and avail ourselves of his amazing guiding services the next time we return to Scotland. We had a fantastic day out with Peter. He is very knowledgeable and humorous too. His flexibility during changing weather conditions was very much appreciated. We would recommend him for any tour. We were impressed with both Peter's fund of knowledge as well as his ability to keep all ages engaged. He was accommodating with regard to the seniors who were with us and added a bit of whimsy for the children. He went above and beyond researching specific places we wanted to explore. Would definitely recommend him for family groups! Peter kept our three girls engaged, provided history of the city and some human details. I would highly recommend him! Peter was great! We had a fantastic day in Edinburgh and got to see so much. Peter is knowledgeable, professional and provided us a great experience! Edinburgh is beautiful and Peter made sure we saw and learned so many things! TOUR GUIDE RESPONSE: Hi Darin Its nice to hear that you both enjoyed the tour. Peter. A perfect way, to enjoy a day in Edinburgh. Peter's knowledge and enthusiasm of the city made the six hours fly by. 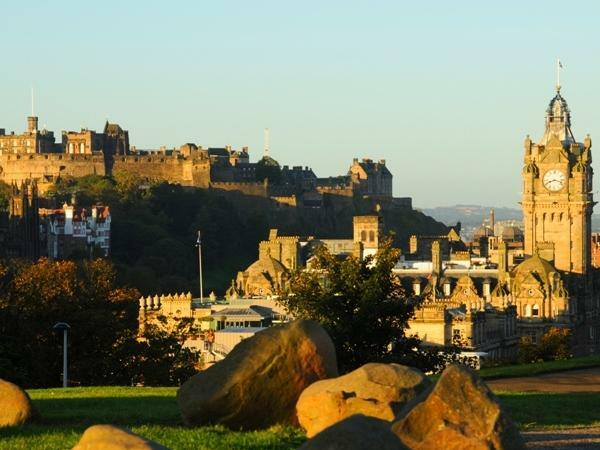 Visits to the iconic sites like Calton Hill and the Castle were combined with off the grid locations like graveyards and the amazing RSB property of Dundas House. Peter's ability of weaving local folk law stories with Scottish history transports you from the cities past through to the present. Highly recommended. Peter was excellent! Tailored our tour to our group, excellent presentation with just enough history and great stories! Was a pleasure to have him introduce us to Edinburgh. Will ask for him next year when another group comes to Scotland! Thank you! Peter was awesome a true gentleman. Plus a great story teller and full of interesting facts. We wanted to see the less public / touristy part of Edinburgh and he took us to some great sites. Well done. Peter was the best. We booked the full day tour, wanting to take our time and see the city. We were well rewarded for our time spent with him. With his knowledge and local insights, not only did we see the "normal" tourist sites, but also the charming "out of the way" locations that make the city special. Use Peter, you will not be disappointed. Peter has extensive knowledge of Edinburgh and conveys it in a very interesting manner. You will be lucky to have him as your guide. We enjoyed our time with Peter very much. He is quite knowledgeable about the castle and Edinburgh, and certainly friendly. Peter also gave us some good tips for restaurants which we appreciated. I recommend him without hesitation. Peter was our guide for two days in Edinburgh. He's excellent! His recall for dates and names is extraordinary. As is his story telling around historical events and the people who shaped them. TOUR GUIDE RESPONSE: Hi Eric Thank you for the review but most importantly you both enjoyed the tour. Peter. Peter was an excellent tour guide with a wealth of knowledge about Edinburgh. He kept us fully interested throughout and even took us through some of the lesser known and fascinating parts of the city. His knowledge was deep enough to answer some of my more esoteric questions. Peter came to our hotel and picked us up, WOW that's customer service. He was extremely knowledgeable of the city's history and areas visited, attentive to our older walkers and made sure we had plenty of time for pictures. I would definitely recommend him to family, friend or anybody visiting Edinburgh. Thank you Peter for all your insight. TOUR GUIDE RESPONSE: Hi Leticia It was my pleasure to have you all on tour, and thank you for taking the time to write a review it is much appreciated. Peter was a great guide-- he tailored the tour to our interests perfectly and gave us a totally engaging day in the city. Definitely recommended! Peter combined a rich knowledge of history with lifelong experience in Edinburgh. He interspersed stories of growing up in the area with explanations of cultural, geologic, political and historical significance. We really appreciated Peter's adeptness in modifying our day to suit our interests and physical abilities. His rapport and genuine interest was evident throughout our trip. We would definitely recommend Peter and hope to see him again! Peter was fantastic! Knowledgeable and paid attention to our requests as to what we wanted to see. Made the city come alive. Never could have done by ourselves. Highly reccommend. Peter was fantastic. He was able to engage the adults and the 13-year-old for 2+ hours about Harry Potter and the city's history. We really felt as if we knew the city by the time the tour was done. He has a terrific sense of humor and deep knowledge of Edinburgh's history and its writers. I'm very grateful that we had this introduction to the city. Amazing tour!! Peter was amazing and we learned so much about Edinburgh in a short period of time! Thank you for the outstanding experience!! Peter was excellent! Very prepared, professional and knowledgable! A fantastic walking tour he took us on. He went at our pace and kept us entertained the entire 5 hours! Would definitely request him again! TOUR GUIDE RESPONSE: Hi Paige Its a delight for me to know that the tour worked for you both, and thank you for your kind thought. Peter. We had an amazing 3.5 hour tour with Peter! He told stories, gave us interesting information about the city, and made us really feel welcome. He catered the tour to our specific needs and requests, which was wonderful. I was so happy to not be in a big tour group! We got to ask as many questions as we wanted (because it was just my boyfriend and I) and could stop to take pictures, get a coffee, etc. along the way. After the tour we were experts at getting around the city, which was wonderful! TOUR GUIDE RESPONSE: Hi Lindsay Thanks for taking the time to write a review, and good to hear that you both enjoyed the tour. Peter. We had a fantastic time with Peter and I would highly recommend a tour through Edinburgh with him! We booked a 3 hours walking tour around town and it was the perfect mix of sights, views, facts and fun. Peter knows his city, old and new history and even some places to warm up during a cold day :) He showed us sights we would not have discovered ourselves, we saw and learned lot more than we could have covered in that time. Thank you for being such a great guide and for available on very short notice! TOUR GUIDE RESPONSE: Hi Tina Thank you for taking the time to send a review, I really enjoyed the tour as well so winners around. Peter. I enjoyed the tour immensely. Peter knows his stuff. We started in the castle and mainly covered the old town with some part of new town. Peter told me lots of anecdotes and the stories behind everyday phrases and idioms. He is very knowledgeable about the history and having lived in Edinburgh all his life he knows the current political and social situation. I don't think I would have found a better guide. TOUR GUIDE RESPONSE: Hi Suneel Good to hear that you enjoyed the tour, and thank you for taking the time to send in a review. Peter. Peter is a wonderful guide with a very easy going manner. He is thoughtful and easily handled all of the questions we had. Dean Village/Water of Leith/Stockbridge is a beautiful area off the normal tourist beaten paths. Our 3 hours flew by. Thanks Peter!! Peter was a terrific guide, he tailored the tour for us, which was great. Peter is extremely knowledgeable about Edinburgh's history, he could answer all our questions. We had an amazing day, our 14 year old loved hearing about Edinburgh's history, Peter knew exactly how to keep her interested. Peter is an excellent guide who tailored our tour specifically for our interests in writers, as well as a general orientation to Edinburgh. It was immediately clear that he brought a wealth of experience as a guide by the way he orchestrated the pace of our walking and the delivery of historical facts relevant to our location. He was a master of describing the cast of characters who left their mark on this wonderful city over the centuries. TOUR GUIDE RESPONSE: Hi Peter Many thanks for taking the time to write a review and for your kind words. Peter. Peter was a wonderful guide. His interesting stories made the streets of Edinburgh come alive! Highly recommend Peter and ToursByLocals. Peter was fantastic! We very much enjoyed his history of old and new Edinburgh, seeing the city from various viewpoints and visiting areas off the beaten tour path. He was very engaging. Three and a half hours flew by! Peter was polite, kind and very knowledgeable. He extended his time with us to complete the full tour. We really enjoyed his engaging style and local insights. Bravo. Great guide with amazing love for his city ! Peter was great on every step, every story, and every fact he shared with us about Edinburgh. Three hours tour flew by so quickly and it was very easy and not to difficult or technical for our group. We felt like walking with our friend and learning about each aspect of old town life ,understanding what, how and why? Great three hour tour of Edinburgh. Very interesting insights into the city and its history. He was very attentive to one of us who had a stamina issue. Resting pauses were filled with little tidbits of everything around us. Lots of hills to contend with but it goes with the territory in Scotland's capitol. I am a little late in providing feedback but not because it wasn't a great tour. Peter was from the area and knew central Edinburgh very well and knew all of the small closes and their history. He was engaging and provided a well paced tour. I highly recommend him as a guide. TOUR GUIDE RESPONSE: Hi Steve I am glad the tour went well for you both. Peter. Peter went out of his way to give me the perfect tour for my interests. We had communicated by email before the tour and he was careful to show me everything I wanted to see. He also helped me get my train tickets and get mobility assistance. He really helped make my dream trip everything I had hoped for. I honestly can't imagine doing this tour with anyone else. Peter H. was exactly what I was hoping for in a guide of Edinburgh. We did the 3.5 hour private tour, "Tale of two cities", and it was thoroughly engaging, insightful, educational, and fun for my parents, my wife and I, as well as my 15 and 12 year old kids. Peter, having generations of history in this amazing city, knew so much about the history as well as seemingly every nook and cranny, which he shared in great detail. Thank you Peter!!! TOUR GUIDE RESPONSE: Hi Ken Delighted that the tour went well for all the family and thank you for your kind words. Peter. Peter was a wealth of knowledge! I strongly recommend his as a tour guide. He was professional and appropriate. He was an incredible storyteller and a joy to spend the day with. TOUR GUIDE RESPONSE: Hi Tammy Firstly thank you for your kind words, but most of all it was great to meet you and to hear you both enjoyed the day. Peter. Peter gave us an excellent tour. As a native of Edinburgh his excitement and attraction for his city are evident. He exposed us to many aspects of Edinburgh that we otherwise wouldn't have enjoyed. Perfect first time tour. Peter was filled with anecdotes, history and so accommodating to our needs. Thank you! What a great tour we had with Peter he is very knowledgeable about Edinburgh and his stories about events in the city was delightful! Strongly recommend him as tour guide!!!! Peter gave us a wonderful overview of the history and current context of Edinburgh. He answered all our many questions. Peter is fabulous!!! During the almost four hours we walked through Edinburgh, his dialogue was informative, entertaining, and exactly on topics of which we are interested! We visited most of the significant sites, but only spent as much time at each one that our interest dictated. It was festival time (Tattoo, Fringe, etc.) in Edinburgh, so the city was very crowded, but Peter made this a plus rather than a minus. I cannot imagine anyone who could guide a visitor to Edinburgh better than Peter! TOUR GUIDE RESPONSE: Hi Judi Thank you for the review and great to hear that you enjoyed the tour. Peter. Peter was great! He suggested a convenient place to meet and tailored our tour to finish up near where our car was parked. We were all exhausted from our overnight flight but Peter kept us all entertained and interested with his stories and local knowledge. He even took our picture at different sites so that we could all be in the photos. I would highly recommend him. Peter was fabulous! His enthusiasm, knowledge, and love of all things Scottish really brought Edinburgh to life for us! We left him with a renewed appreciation of the history and culture of this remarkable city. Definitely a well spent few hours with a wonderful guide. Highly recommend! We had an excellent tour with Peter he did a wonderful job accommodating the wide range in age and mobility in our group and really engaged the children. Peter was exceedingly knowledgeable and very pleasant. He put up with my husbands lame jokes. He was extremely informative. Enjoyed it tremendously. TOUR GUIDE RESPONSE: Hi Linda I am glad you both enjoyed the tour, and thank you for taking then time to write a review, it is much appreciated. I hope the rest of your holiday goes well. Peter. Peter was knowledgeable, enthusiastic and extremely personable. He was able to turn a very rainy and chilly day into a pleasant introduction to his lovely city. TOUR GUIDE RESPONSE: Hi Steven Glad the weather didn't dampen the experience for you both, and thank you for taking the time to write. Peter. TOUR GUIDE RESPONSE: Hi Ken Its good to hear you all enjoyed the experience, thank you for taking the time to write a review, and thanks for DC offer. Peter. Peter's tour was fantastic. He presented Edinburgh's elegance and magnificent history well and eloquently. His talks were much more than a boring recitation of dates and names. He brought in personalities, links to America, and historical items, and (perhaps) a bit of gossip. Very good time was had by all. TOUR GUIDE RESPONSE: Hi Robert Firstly thank you for your kind words and taking the time to write review. Its great to hear you all enjoyed the our. Peter. Peter was very accommodating and knowledgeable! TOUR GUIDE RESPONSE: Hi Roxanne My pleasure to show you Edinburgh, and its great to hear you enjoyed the day. Peter. Peter's tour was comprehensive and well paced. He is knowledgeable about the area and we enjoyed both his historical perspective and his anecdotes about life in Edinburgh. Peter was fantastic. He was very knowledgeable, friendly and he gave us a fabulous tour of Edinburgh. We highly recommend him. Thank you Peter for a great morning! Another great day with Peter! He is an extraordinary guide. We learned so much and were able to see things we would never have found on our own. He's also a very nice guy, and his recommendation for a dinner restaurant was superb. Peter is a superb guide and storyteller. There is no better way to see Edinburgh. Much more than I had even anticipated. His knowledge of the city's history and sense of humor are terrific. TOUR GUIDE RESPONSE: Hi Natalie Thank you for taking the time to write a review it is much appreciated, but even better knowing that you enjoyed the tour. Peter. Peter was an extremely interesting,well prepared and considerate guide. A great way to spend a morning learning about his fascinating city. TOUR GUIDE RESPONSE: Hi Mary-Lousie Thank you for taking the time to write a review, glad to hear you enjoyed the tour. All the best for the rest of your stay in this wee country. Peter. We loved Peter. He took us to places we would have never seen on our own. He was gracious, clear, knowledgeable, and great to be with. Peter was very informative and gave us a good knowledge of Edinburgh past and present - would highly recommend to do tour when you first arrive in town. Excellent tour with Peter! He was entertaining and he informative! Our appreciation and pleasure in visiting Edinburgh was much enhanced by our tour with Peter. In addition to having an obvious enthusiasm for the city, Peter is a fountain of knowledge. Peter has a knack for presenting all of this information in a casual conversational manner which really mitigates the feeling of being overwhelmed with facts and information. Peter's engaging manner made the day flew by, despite the fact that we walked many miles and spent the better part of the day with Peter. Peter did an excellent job on our Royal Mile Tour yesterday. He was friendly and very knowledgeable. Peter is a great storyteller who made history come alive for us. I would highly recommend him as a personal guide. We had a fabulous time with Peter on our tour. He was informative and friendly, even waiting for us when we were delayed on the train. I would highly recommend his tours and hope to see him again when we return to Edinburgh. Thank you, Peter! Peter was professional, well spoken, knowledgable, energetic and witty. He made our family's introduction to Edinburgh and Scotland memorable. We highly recommend him for any individual and/or group tour. A huge thank you Peter! Peter was great. He was a real showman who made the area come alive. We would highly recommend him. Peter was an excellent & informative tour guide- highly recommend this tour. TOUR GUIDE RESPONSE: Hi Joan It was a delight to meet you all, and take you around Edinburgh. Peter. Met with Peter today. Give tour 5 stars, he was very interesting and informative and kept the tour moving at a good pace. Peter was a fabulous guide. His love and knowledge of Edinburgh was obvious right from the start. He provided us with details about all the little things that you couldn't get from tour books on your own. It was 4 hours very well spent! TOUR GUIDE RESPONSE: Hi Rita Thank you for the kind words and taking the time to write the review. Hope all went well for you guys in St Andrews, safe journey home. Peter. Excellent communicator. Very aware of clients needs. Took into account others around us and spoke to us in quiet spots so we never missed his remarks. He is knowledgable and an excellent educator. Yes, I would use him again and I would send my friends to him.